Aspen developed a standard chiller module, which would integrate into a customer’s chiller, or directly into their assembly. Ultimately, this subsystem was intended to leverage Aspen’s refrigeration expertise while giving the end user the most design flexibility. 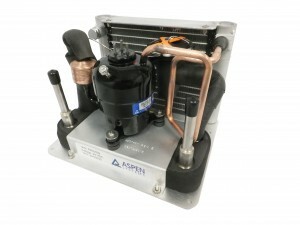 Aspen developed the LCM module to satisfy the growing market segment of customers who want to take advantage of Aspen’s refrigeration expertise, but can handle the coolant circuitry and the system controls. The performance of LCM depends on the supporting components (pump, fans, coolant) however the LCM offers over 400 W of capacity and can operate in ambient environments as warm as 50°C.